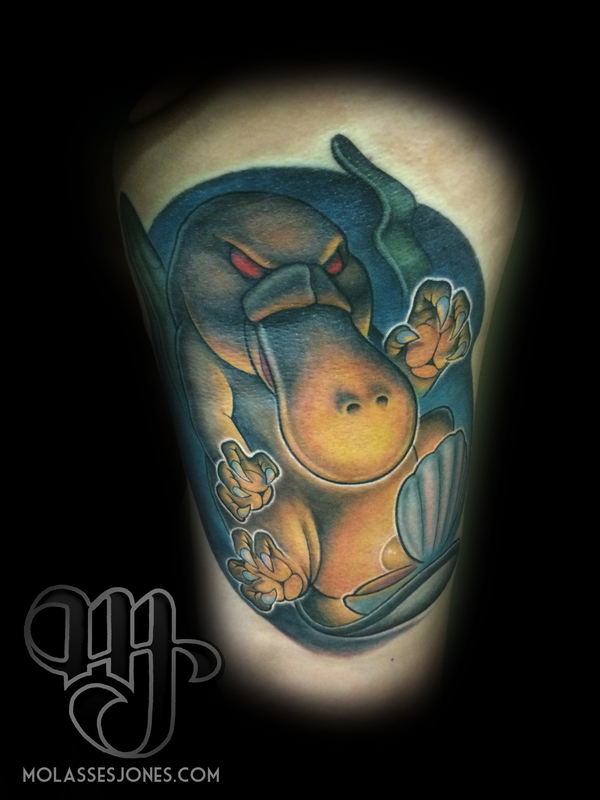 Molasses Jones is originally from South Carolina, he and Ben Gun met at a convention and immediately Molasses was invited for a guest spot at the best tattoo studio in Denver. After getting his first tattoo at 19, he was “bear hugged” by the ink, and started to draw some of his friend’s tattoos. Little after that he was messing around with actual ink. By the time he left the Marine Corps he already had a small portfolio, which got him a job at a street shop in his hometown back in 2010. Since then he hasn’t looked back and every day is thankful for doing what he’s really passionate about. His favorite tattoo style is New School, warped images and bright and bold colors, the crazier the better, as he explains his tattoo philosophy… “My training would be that I’m not right in the head and this is how I see the world. Just trying to share what I see with everyone else”. 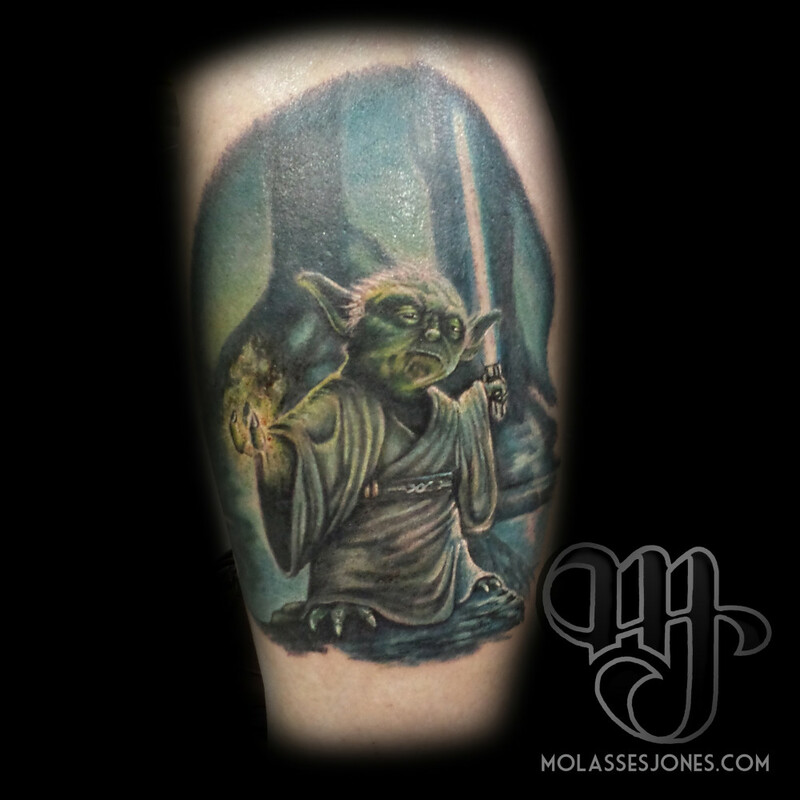 Being a Star Wars fan, his favorite designs to tattoo are anything geeky, super heroes, comics, video games and movies… the nerdier the better! Even so, the most difficult tattoo he has done was a portrait of someone, while the person in the picture was sitting next to him…. Extremely nerve wrecking he describes it. Molasses will tattoo almost anything, except for hateful material, as he says: “There’s already enough of it in this world and I don’t need to add more via my tattoos”. His final advice is for all the ones thinking of getting ink for the first time; find an artist you like and trust their judgement. Otherwise find one you trust. 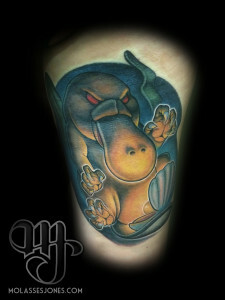 Schedule an appointment and get a new tattoo with Molasses Jones! !